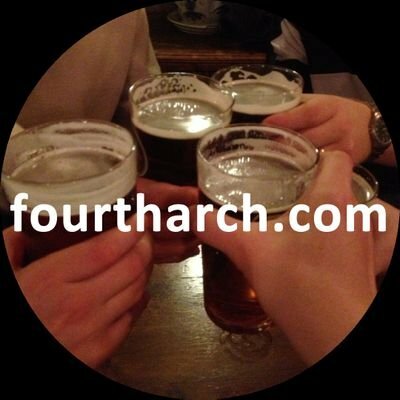 The Cardiff branch of Fourtharch.com certainly embraced “Dry January” this year. 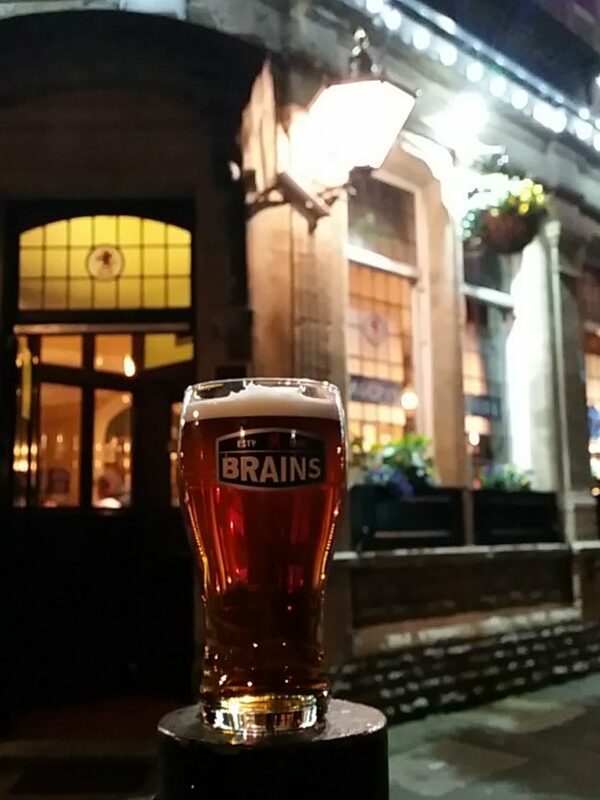 Mainly because the local Brains Brewery slashed the price of a pint for the month and topped up their £40 gift cards with a free £10 voucher that could be used to buy beer in any of their pubs. For the brewery at the end of the day is a business and not a charity and the free beer and cut price promotions were put in place to encourage punters back through their doors in January, a month that is traditionally quiet for trade coming so soon after the festive season. I congratulate Brains for totally ignoring a pressure groups blanket campaign suggesting the whole country should give up booze for a month. I wonder what the reactions would be to maybe a similar campaign suggesting the nation stop eating pies, pasties and cream buns for June to assist with the obesity crisis? So before some human rights equality pressure group demands that our women are injected with Testosterone so that they too are able to grow a moustache for Movember, maybe the Alcohol Change UK charity would like to know that even with free and cut price beer all Fourtharch.com members drank no more or no less beer during the “Dry January” campaign. The good news is that we all saved around £50 each that will now go towards the props budget for this year’s Fourtharch weekend official video production, the theme this year is most definitely Canada and will feature everyone’s favourite cuddly character Barrie the Beaver and watch out for details soon on the new Fourtharch theme song and Morris dance. This entry was posted in Uncategorized on February 7, 2019 by fourtharch. This entry was posted in Uncategorized on August 29, 2018 by fourtharch. 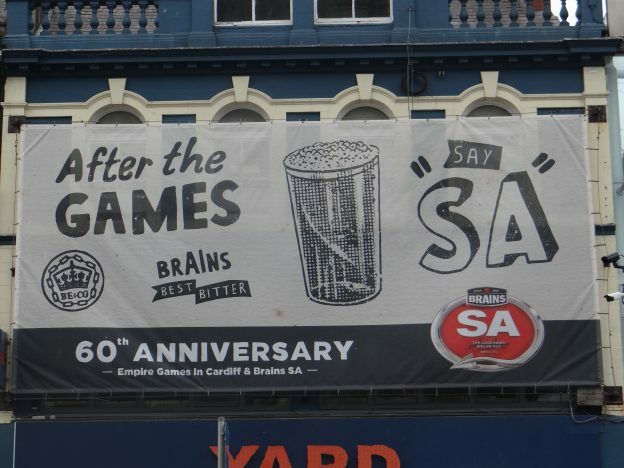 So, I was just about to publish Great Paul’s blog all about how the mighty Brains Brewery were stealing a style of writing from the smaller, newer, hipper Tiny Rebel Brewery, when I realised that the Brains version was a reproduction of their own advertising from the launch of their SA beer from 60 years ago. It got me thinking about how the world changes in some ways but stays the same in others. We now have a world whereby every town has it’s own local beers brewed in small batches by small breweries and those beers are often hard to find outside of the local area. Haven’t we been here before? This entry was posted in Uncategorized on August 20, 2018 by fourtharch. 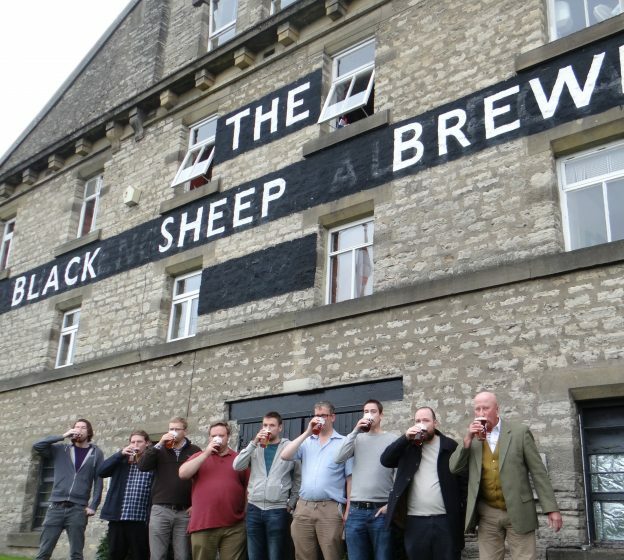 The founding of Black Sheep Brewery is also a great story, with Theakson Brewery no longer under family control, Paul Theakston left them and eventually set up his own brewery. The original plan having set up in the former Lightfoot Brewery was to resurrect that name. Unfortunately for Paul, the name had already been trademarked and in fairness to Theakstons, Lightfoot is a nice pint. The next idea was to use something about sheep given their link to Masham and the Masham Sheep Brewery was considered as an option. 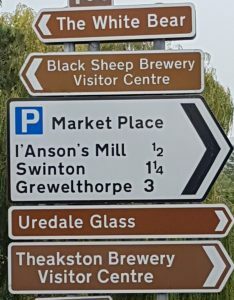 It was Paul Theakston’s wife who suggested that since he’s the black sheep of the family, leaving the family brewery, that perhaps Black Sheep Brewery might work. It certainly did, the brewery is doing very well and producing some great beer! What I enjoyed about the brewery tour (as well as the story of the founding of the brewery!) was the wonderful contrast between modern and traditional. Black Sheep is a modern brewery in the sense that it was only founded in 1992 but most of the equipment was bought up from breweries across the country and is traditional, set in an area with a history of brewing. The tour starts in a modern room with a video of some of the history and information from a guide on the founding of the brewery and information about their wonderful range of beers. As you go around the brewery however, you see that the methods of brewing are traditional and use the local Yorkshire Square Method. The brewery shop and accompanying bar and restaurant and very modern and serve the range of Black Sheep Beer, which is largely traditional Yorkshire bitter. All in all, a great tour followed by an extensive sampling session! For more photo’s, visit our Facebook page. This entry was posted in Uncategorized on August 15, 2018 by fourtharch. 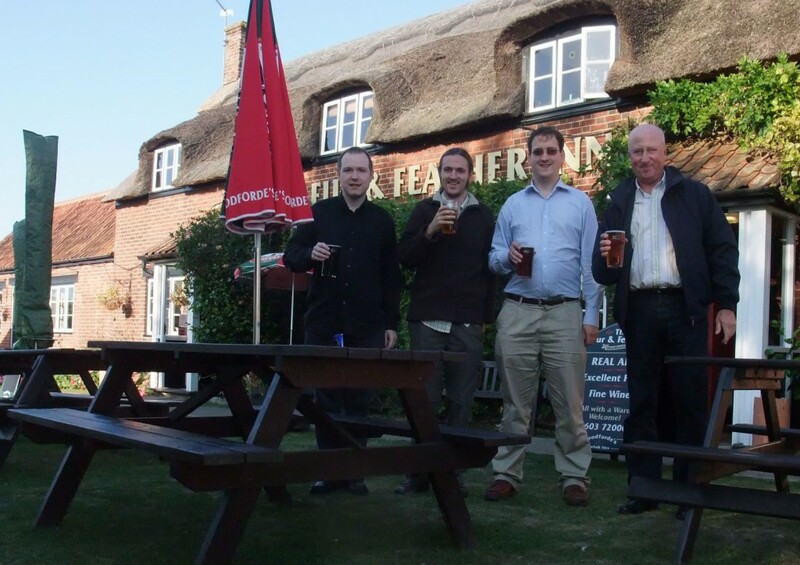 September sees us return to Woodforde’s Brewery, the site of our first annual trip back in 2009. We take it in turns each year to chose a pub to take the rest of the group to and as the group has grown year on year, no one has had a second choice. On trip number 10, we are however revisiting a pub- Great Paul choose the Fur and Feather, site of Woodforde’s Brewery for our first trip. What we didn’t manage to do on that occasion was a tour of the brewery as they weren’t done on Saturdays back then. 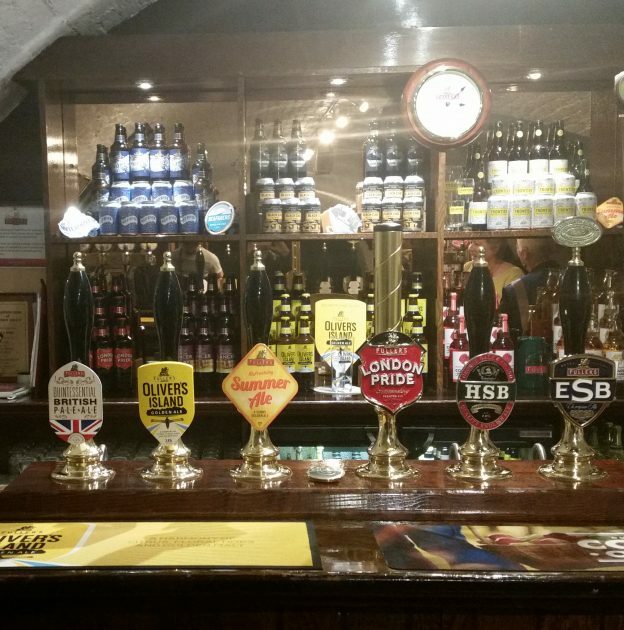 This year, Paul of Norfolk has chosen the Fat Cat in Norwich as the feature pub, which allows us to make it back to Woodforde’s and finally do that tour! This entry was posted in Uncategorized on August 8, 2018 by fourtharch. Always a sad story when we write an RIPub, most of them are older pubs than this but as soon as I heard about this closure I knew I had to write this. The first reason is a personal one- the Barley and Rye was a regular haunt for our monthly works drinks and I found out about its closure literally a couple of hours before I was due to go there! I got an e-mail about a change of venue to another pub, which I assumed was because the other pub had a beer garden and it was a sunny day but as I read further I found out that it was because the pub had closed. The second reason that I wanted to write this is because with the new craft beer revolution there seems to be an idea that a place can’t fail. One of the things about the pub industry is that there is no magic formula to running a successful pub. There are definitely things you can do wrong that will make a place more likely to fail but it is also possible to appear to do things well and still not succeed. 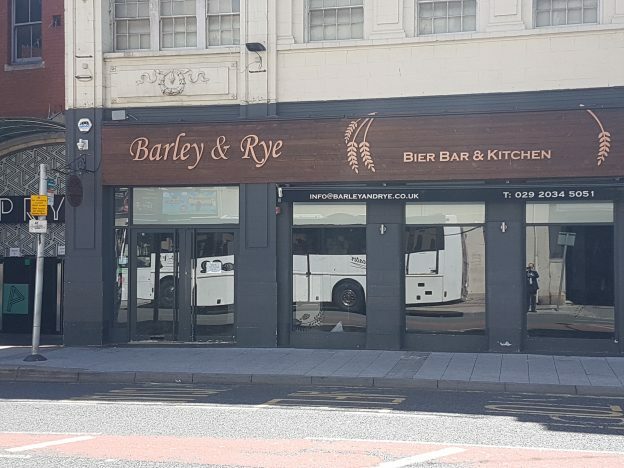 I liked the Barley and Rye- it had a great range of beer- most of it keg but with three cask lines and also a wide variety of craft in cans and bottles. In an ideal world I’d have liked more cask than keg but they had a variety of really good keg beers- I used to enjoy a Coast to Coast or a Whitstable Bay Stout. What sadly became clear though was that it wasn’t getting the trade. Something that stood out for me was that fairly early on they only had one cask line in use because they didn’t have the turnover, which was a shame because the one line was well kept and was generally a good beer- Atlantic was a frequent one. I didn’t think they did a lot wrong and had there been a better early trade and word spread and cask was viable, would it have taken off? This entry was posted in Uncategorized on August 1, 2018 by fourtharch. Bit of a rant but as a beer website I feel we have a duty to educate the world about beer! There are some really great craft ales out there but for now at least, cask is king for us and we are glad it’s not affected by the CO2 shortage! This entry was posted in Uncategorized on July 10, 2018 by fourtharch. Hello Playmates as Arthur Askey used to say, I was in Portugal back in May to report on the Champions league final in Kiev and I tell you what folks my hotel room on the Algarve with balcony and wide screen TV was so good that I decided to cover the game right from there! The only thing missing was beer, so while I left the TV warming up I headed down to the local Minipreço to stock up for the match. Now I don’t actually take seriously anything that fourtharch founder members Great Paul and Mogi usually tells me but they were absolutely spot on about the choice of beer in Portuguese supermarkets that is Superbock, Superbock or Superbock – no proper British beer at all! I did manage to find one can of San Miguel hidden away on the top shelf but just as I was considering wine as a possible alternative my luck was suddenly in. 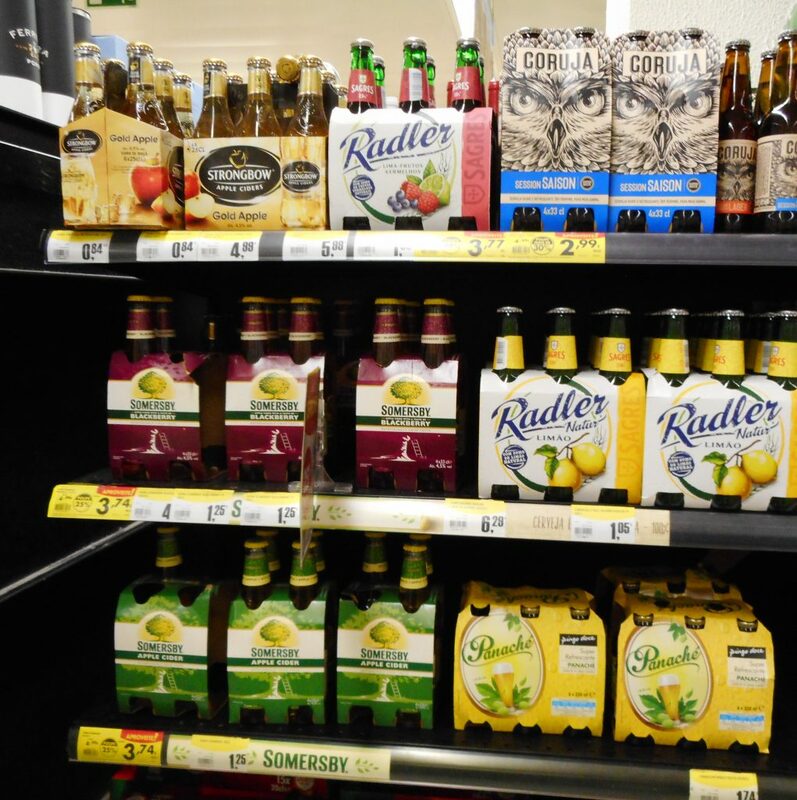 At the very end of the beer (or Superbock) isle I discovered a very healthy display of English Ciders. Look out Mr Bearing, I thought as I recalled the time I picked up one of those industrial size plastic containers of homemade cider from a farm in Somerset back in the 60s – one swig of that and suddenly the whole lot was gone. I lost two days and even forgot I was married… so it wasn’t all bad. 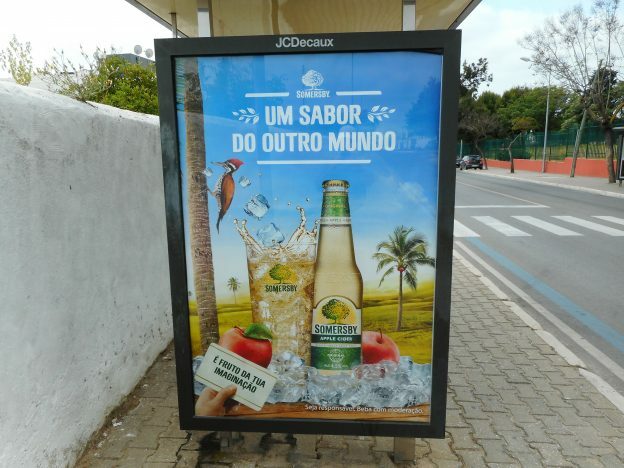 The fine people of Portugal have acquired a real taste for English Cider of late that these days is more of a pleasant soft drink compared to the Scrumpy of years ago. If there were any hallucinations to be had while drinking the stuff watching the game such as the world appearing in slow motion and turning upside down well that was provided by Ronaldo’s pace and the spectacular bicycle goal scored by Cardiff’s very own Christian Bale. I finished off the evening up on the 6th floor hotel bar with a couple of those Emoji cocktails. You know the ones with garden mint in them and that with the cider earlier on may have been responsible for a very strange dream I experienced involving Ronaldo and the Wurzels all singing “I am a Cider drinker” that was originally set to the tune of Una Paloma Blanca the song we all came back singing from our Spanish Holidays in the 1970s – funny what goes around comes around init? 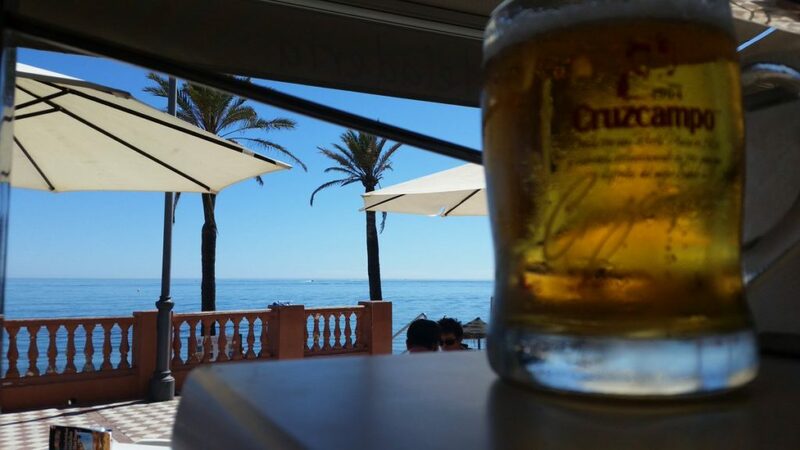 British beer is never going to break into the Portuguese market so come on CAMRA instead of wasting time debating the “L” word [that’s Lager to you and me] let’s all get behind the cider boys and blow an even bigger hole in the Portuguese Superbock shelves and fill it with Somerset’s finest – probably brewed in Dublin. Real Madrid beat Liverpool 3-1 by the way as for me I cannot seem to get the image of Ronaldo, the Wurzels and that cider song out of my head – I think my grandson calls it an “Earth worm” See you next time folks. This entry was posted in Uncategorized on July 1, 2018 by fourtharch. Is there a right time of year to drink different types of beer? I’ve been inspired by the changeable UK weather to talk about whether there is a right time year to drink different beers. Conventional wisdom is that you drink darker maltier beers in the winter and lighter hoppier beer in the summer when it’s warmer. I do understand the logic that you might want something more refreshing and thirst quenching when it’s hot and you might want something maltier and warming when it’s colder. Personally though, I like a good beer and I like the styles that I like regardless of the time of year. One of the challenges I find as beer drinker starts around this time of year- it’s June, so the start of the Northern Hemisphere summer- is that there does tend to be a prevalence of golden ales and blondes. I like to drink a variety of beer styles but I find I struggle more in the summer than I do in the winter. 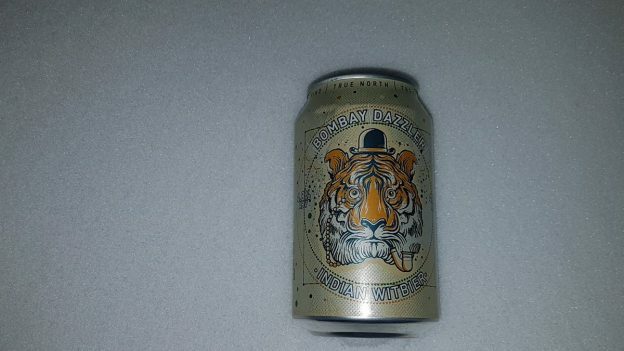 I think this comes from two things, partially that the styles I tend to favour are “winter” beers- I like red ales, traditional bitters, stouts and porters, all of which are harder to find in the summer. Part of it though is that I’m convinced that there are less “winter” beers in the summer than there are “summer” beers in the winter. It is anecdotal but in my experience you can usually find a hoppier beer like a golden ale or an IPA in the winter but you can’t always get a red ale or a cask stout in the summer. The one concession that I will make to all of this is that is a temperature point where I will move across to something lighter and more refreshing- it has to be said that that point is quite high- somewhere in the region of high thirties Celsius or nineties Fahrenheit. At that point is it time for something thirst quenching and I’m likely to wanting a hells or a pilsner. Are there too few malty beers in the summer or am I just bitter? This entry was posted in Uncategorized on June 4, 2018 by fourtharch. 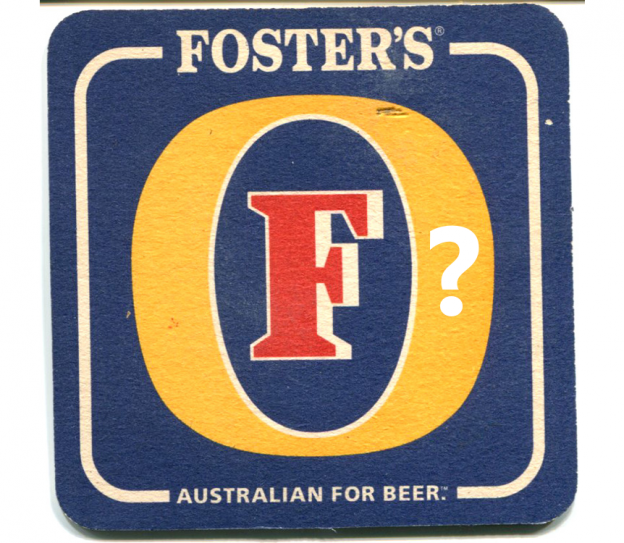 So Do We Have to Support Fosters Now? Interesting times for CAMRA with the recent changes to it’s articles. 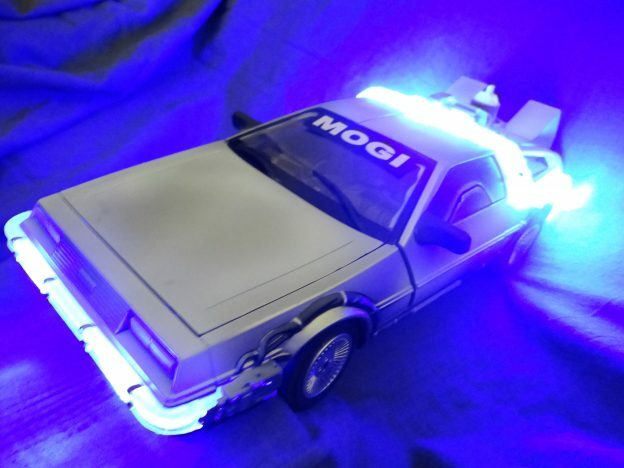 I’m not sure what to make of it. CAMRA was founded when real ale was struggling because it was kept poorly and people were turning to more reliable but crap creamflow beers. Times have changed and keg beer is in a very different place now- craft breweries are brewing some really good keg stuff. I’ve spoken to a number of craft brewers and keep getting the same story about the shelf life of cask and the difficulties of transportation and the greater risk you have to take as business to make cask. I understand that and anecdotally I see more good beer on draft and less creamflow and less Fosters. I know now of a number of local bars and brewery shops where I can reliably get a wide range of really good keg beer that I’m happy to drink without being overly concerned that those places don’t have cask. All of which being said, I still struggle to entirely back the changes made by CAMRA. It comes down to two things for me, where do you draw the line as to what is good beer and what is CAMRA for. I understand that we are now in times where there is a variety of good beer and not all of it is cask. I just don’t know how we define that- how do we now say that CAMRA will support a great craft beer but not Fosters, if we say it’s beer not lager that CAMRA stands for, where does that leave a craft pilsner. It then opens up questions of what CAMRA is all about, the line was drawn that it would be about cask and not keg. I find it hard to come to terms with the idea that the Campaign for Real Ale could campaign for other beer. I’m not saying that cask is the be all and end all and the there shouldn’t be other beer but that doesn’t mean that CAMRA has to be the voice of it. Maybe there is room out there for another organisation that stands for all beers- I think there should be representation somewhere to promote quality Belgian beers, really crisps pilsners and the fantastic range of craft beer that exists now. Perhaps that organisation could represent all pub goers and drinkers regardless of what they drink but for me CAMRA needs to support the cask beer that it was founded to promote. This entry was posted in Uncategorized on April 28, 2018 by fourtharch.